-- Select a Size -- 8-10" 12-14" 14-16"
Dazzle your pet with a gift of this sparkly collar from Cha-Cha Couture! 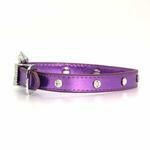 The Foxy Jewel Dog Collar in Metallic Lilac is a perfect addition to your diva's collection. 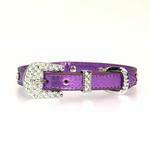 This collar is adorned with high quality crystals and a glam buckle that finishes this collar for dogs off perfectly. Foxy Metallic Jewel Dog Collar by Cha-Cha Couture - Lilac Customer Photos - Send us your photo! We call her Poppop for short! Smaller than expected and very bulky. Fun on line products for dogs. we like to shop here for our grandpups and Mini our great dane.